Recently, TV Land released its 100 Greatest Catchphrases list. It was a good list, I'll give them that...but I was surprised by all they left out. So first, TV Land's list...followed by my list, the 100 More Great Catchphrases. 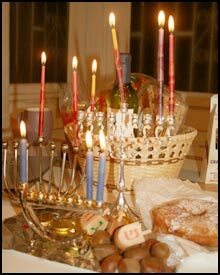 To all who celebrate the Festival of Lights...Happy Channukah from my family to yours. I've been MIA the last week or so....but with good reason. About a week and a half ago, I began experiencing this very weird pain. It was in two different places in my abdomen. I couldn't figure out what was wrong. Within a few days, I had completely lost my appetite and was dealing with increased nausea and severe fatigue. I made a doctor's appointment, but before I could go in, the pain became very severe and I ended up in the ER. I am very happy to report absolutely NO problems with this ER visit! The nurse was incredible, checking on me at least every 10 minutes, the resident and the attending were both great doctors who treated me with the upmost care....not a Tin God in sight. I was given pain relief WITHOUT having to either ask or beg for it. My concerns were taken seriously and my questioned answered promptly. I was treated both with care and respect. I have written letters of complaint to the hospital in the past for poor treatment, and it was a great joy to write instead a letter of appreciation. But, back to the issue at hand. At first, appendicitis was suspected, which frightened me. I am no big fan of surgery. After that was ruled out, the doctor was perplexed. It seemed like another case of kidney stones, but it also seemed like another case of ovarian cysts. After much testing it was determined to be BOTH. I've had kidney stones, and I've had ovarian cysts. Never have I had them both at the same time. Trust me on this...it's not an experience I wish to repeat. Despite my extreme dislike of surgery, I am now very seriously considering my OB/GYN's suggestion that I have my ovaries removed. I am, quite frankly, tired of all these cysts, and knowing that my parternal grandmother died of ovarian cancer, I am forever worried that someday it might not be a cyst at fault. And to be frank, my periods have been very troublesome since I had my tubal ligation three years ago. I would not be sorry to bid them adieu. In addition to the kidney stone/ovarian cyst problem, I am having yet again another Prescription Refill Disaster. This time it concerns not my pain meds, but my Tegretol, which I use to combat the trigeminal neuralgia. The very last thing I need right now is a bout of the neuralgia, so it's very important that I take my meds. Tegretol is also a drug which needs to build up a "level" in your bloodstream. I always call it in for a refill several days before I run out, so that I DON'T run out. Well, it didn't work out that way this time. I kept calling my pharmacy to check on the refill, and they kept giving me the same answer: my doctor's office had not yet called back. I contacted the Prescription Coordinator, and got the ever-present voice mail. I was finally able to speak with him, and the first words out of his mouth were, "I don't even see that medication on your record." I've been taking it for over a year now. He then mumbled something about being "behind" and assured me it would be taken care of that very day. That was four days ago. I still have no meds. After playing voice mail tag for another two days, my husband finally called and insisted on speaking with the ever-elusive Prescription Coordinator, who promptly blamed it on my doctor not being in the office. The prescription was then given to the "general pool" so that one of the other doctors could sign it. That was yesterday. I finally got a call from the pharmacy today....it is filled and ready. Unfortunately, it was filled and ready three hours after my husband left for work, so I will not be able to actually get the prescription until tomorrow...which marks two weeks without it. My face started to hurt today. I am also incredibly shaky from what I assume is the level of Tegretol in my system going down. I can't stop shaking. I can't count the things I have dropped in the past week. I see the doctor again on Monday. Because of the cyst/stone situation and now, my face acting up, I have little doubt that I will have to ask for more pain meds this month. I hate doing that, but I don't see where I have much choice. Maybe if my Tegretol had been filled on time, I could've swung it, but now? Not so much. On the happier side, yesterday was my ninth wedding anniversary. My husband bought me some lovely silver nose rings, a beautiful chocolate-brown shawl and a box of Godiva chocolates. I think I'll keep him. Anyway, that's what's been keeping me from the computer recently. Sitting up at the computer desk is extraordinarily painful. I'm beginning to think there's something to my husband's laptop idea. I have always been worried that I would break one in a Big Clumsy MS Moment, but I have really missed blogging and I've really missed my online support group and message boards this past week. Food for thought.